EDITOR’S NOTE: Updated Dec. 8 to reflect launch delay to Sunday, Dec. 10, U.S. time. Rocket Lab plans to roll out the company’s second light-class Electron rocket to its launch pad in New Zealand on Thursday for final countdown preparations, but officials have delayed liftoff to no earlier than Sunday night, U.S. time. The Electron booster, standing roughly 55 feet (17 meters) tall, could blast off from Rocket Lab’s commercial launch pad as soon as 0130 GMT Monday (8:30 p.m. EST Sunday) at the opening of a four-hour launch window. The launch opportunity opens at 2:30 p.m. Monday in New Zealand. Rocket Lab says it has a wider window to launch the rocket, with four hours each day through Dec. 17. Liftoff with three commercial CubeSat payloads was planned as soon as Thursday night, U.S. time, but officials were concerned about high-altitude winds over the launch site, and ideal weather conditions are not expected until early next week. The company transported the Electron vehicle to its launch base last month, after completing full-up hotfire testing. The launch team rehearsed countdown procedures last week, and practiced loading kerosene and liquid oxygen propellants into the rocket. 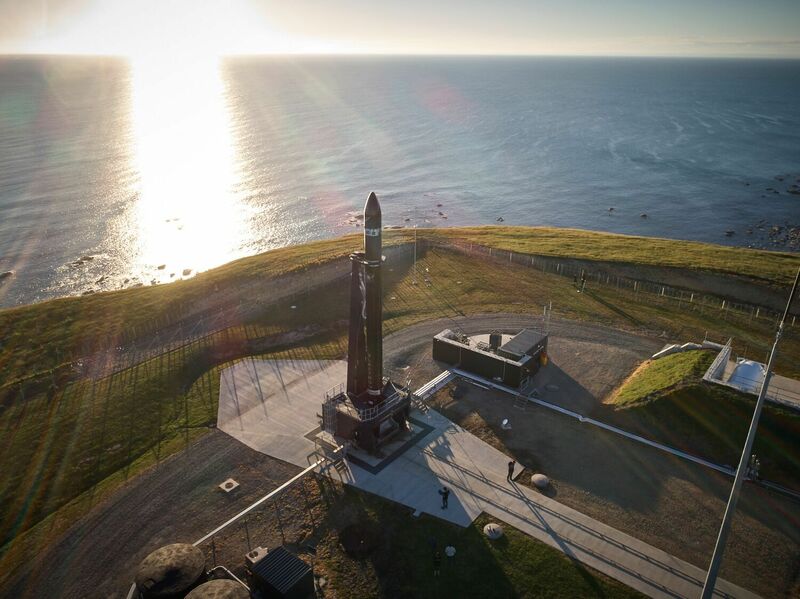 Ground crews at the launch site on Mahia Peninsula, on the east coast of New Zealand’s northern island, transferred the two-stage rocket from its assembly hangar to Launch Complex 1 overlooking the Pacific Ocean Thursday, U.S. time, according to Rocket Lab. 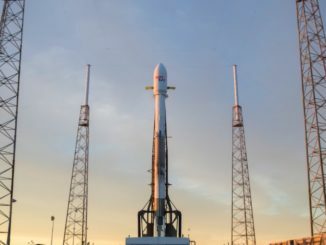 The rocket was raised vertically on its launch mount, and Rocket Lab officials will continue to assess the launcher’s readiness and weather conditions before proceeding with the countdown Sunday. The Electron rocket’s second launch comes more than six months after Rocket Lab’s first orbital launch attempt, which ended prematurely May 25 when a ground tracking computer feeding data to the range safety team stopped receiving signals from the launcher around four minutes after liftoff. Investigators traced the mishap’s cause to a software programming error in a tracking system provided by a third-party contractor, and Rocket Lab’s own ground systems — operating in a shadow mode on the maiden flight — did not suffer the same problem. The FAA announced earlier this week it issued a commercial launch license for the Electron rocket’s second flight. 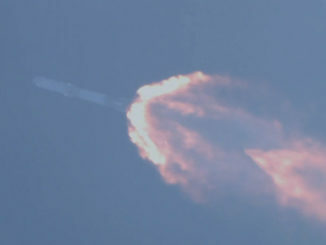 The May 25 test flight, dubbed “It’s a Test,” demonstrated good performance of the Electron rocket’s first stage, and the launcher’s second stage engine ignited and payload fairing jettisoned as designed before the mission was terminated. The results raised hopes the second Electron launch, christened “Still Testing” by Rocket Lab, could successfully reach orbit. Engineers also minimized changes to the rocket, with the most significant upgrade in the second stage, which will debut stretched propellant tanks to accommodate more fuel, O’Donnell told Spaceflight Now. “The performance we saw from the vehicle was really good,” he said in a phone interview Tuesday from Rocket Lab’s development facility in Auckland. “It was actually in the upper bounds of the performance we expected, so that was really positive. But the upcoming mission is still considered a demonstration, and Rocket Lab has a third Electron vehicle built that could launch in early 2018 on a third test flight — if necessary — before the company begins operational launches. Rocket Lab officials said commercial service could be accelerated to begin on the third Electron launch if the second flight goes well. “Our weather limits are pretty generous for the vehicle,” O’Donnell said in an interview with Spaceflight Now. “We’ve got pretty decent ground level winds. A dedicated team will monitor real-time conditions during the countdown in case weather takes a negative turn. The Electron’s nine Rutherford main engines, mounted in a circular web-like configuration at the base of the first stage, will ignite at T-minus 2 seconds. 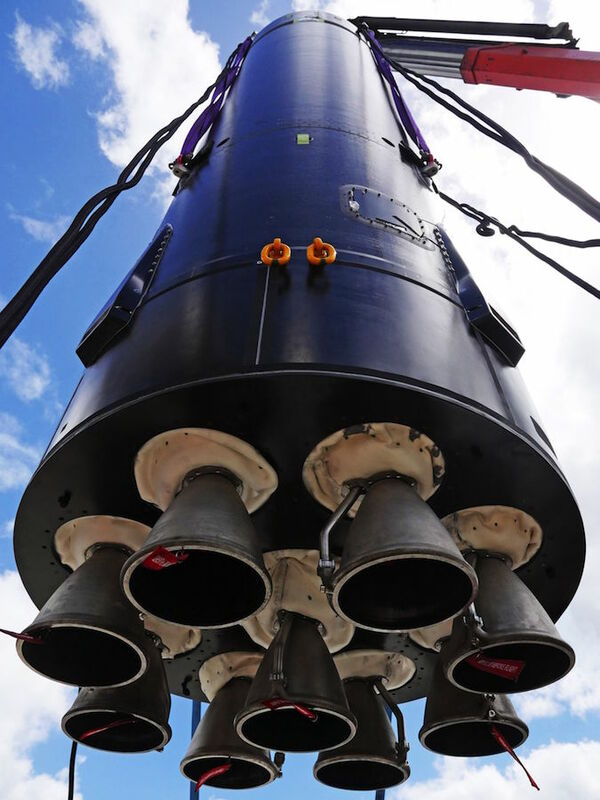 The Rutherford main engines, developed in-house by Rocket Lab, will generate around 34,500 pounds of thrust at liftoff and power up to 41,500 pounds of thrust as the rocket climbs into the upper atmosphere. The Rutherford engines use electric turbopumps, an innovation in the launch industry that first flew on the Electron rocket. The first stage engines are scheduled to shut down around two-and-a-half minutes into the flight, and the booster will release to fall into the Pacific Ocean four seconds later. Ignition of the second stage’s single Rutherford engine is slated for T+plus 2 minutes, 36 seconds. Separation of the Electron’s nose shroud, which covers the three shoebox-sized CubeSats riding on the launch, is planned at T+plus 3 minutes, 4 seconds. The second stage engine is programmed to fire more than five-and-a-half minutes until T+plus 8 minutes, 14 seconds. The second stage burn will be around 50 seconds longer than the firing planned on the Electron’s first test launch, thanks to enlarged propellant tanks that extend about a half-meter (1.6 feet) longer than the tanks on the inaugural flight, O’Donnell said. 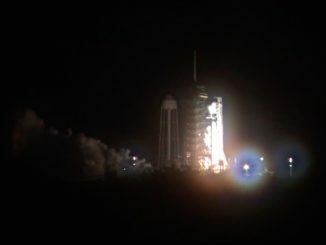 “It just gives us more payload, essentially, thanks to a longer burn time,” O’Donnell said of the bigger second stage. The three CubeSats — one from Planet and two from Spire Global — will release out of Rocket Lab’s Maxwell deployers at T+plus 8 minutes, 31 seconds. Planet’s CubeSat, named “Dove Pioneer,” will join the company’s fleet of Earth-imaging satellites. Spire’s Lemur-2 CubeSats are used to track ship traffic and collect atmospheric measurements to aid weather forecasters. Rocket Lab says it charges $4.9 million per Electron flight, significantly less than any other launch provider flying today, and offer a dedicated ride for payloads that currently must ride piggyback with a larger payload. The company has a launch contract to place several CubeSats in orbit for NASA next year, along with future launch agreements with Planet, Moon Express and Spaceflight, which books launches of small satellites from various commercial and scientific customers. 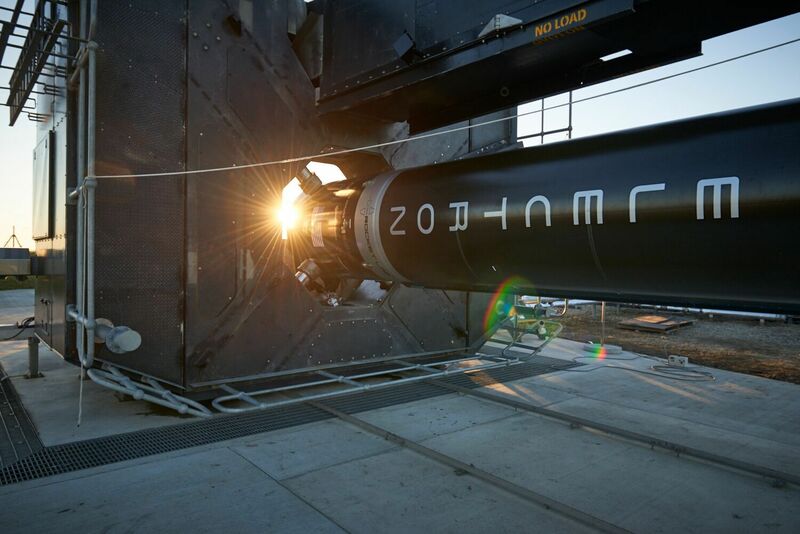 With money from venture capital funds in Silicon Valley and New Zealand, along with a strategic investment from Lockheed Martin, Rocket Lab completed the design and qualification of the Electron rocket with less than $100 million since the company was established in 2006, according to Peter Beck, the company’s CEO and founder. Rocket Lab’s progress was marked with test launches of more than 80 sounding rockets since the company’s formation. If the second Electron mission reaches orbit, it will mark the first orbital launch from New Zealand. “What we’re looking for (on the second launch) is just to close off that final few minutes that we didn’t see on the first flight, where we’re getting into orbit, we’re completing the burn of the second stage and we’re releasing some payloads, which would really be the cherry on top,” O’Donnell said.